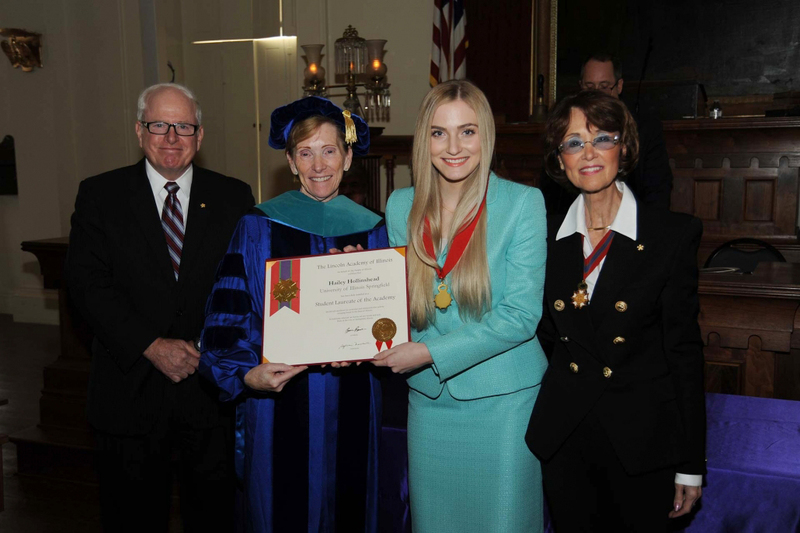 University of Illinois Springfield senior Hailey Hollinshead was honored with the Student Laureate Award from the Lincoln Academy of Illinois on November 17, 2018, at the Old State Capitol in Springfield. Hollinshead, a Springfield resident and graduate of Rochester High School, holds a 4.0 GPA at UIS and is majoring in biochemistry with a minor in Spanish. She has been on the dean’s list every semester she has attended UIS. At UIS, she is a member of the Capital Scholars Honors Program, has severed as a resident assistant (RA) for two years, co-founded a student organization aimed at empowering women called the Legion of Ladies and recently started working as a research assistant at the Southern Illinois University School of Medicine in Springfield. She is also working on an undergraduate research project with the UIS Biochemistry Department and previously was a member of the UIS cheerleading and track teams. Hollinshead has earned several academic honors, including being named the Outstanding Chemistry Student of the Year as well as the Outstanding Organic Chemistry Student of the Year. She has also received awards each semester through the Capital Area Scholars Program for her high GPA and was honored with a Board of Regents Scholarship for her academic excellence. As a resident assistant, Hollinshead was nominated for RA of the month during her first semester of employment, received an evaluation stating she exceeded expectations in leadership and programming, accepted awards for her creative bulletin board decorations and had one of the highest attendance records for student-focused events she helped to plan for Residence Life. As part of Legion of Ladies, Hollinshead helped to collect more than 6,000 pounds of food, earning second place for the most food collected, during the 2017 Trick or Treat for Canned Goods event on Halloween benefiting the Central Illinois Foodbank. The organization also participated in the UIS Dance Marathon where they raised nearly $500 for the Children’s Miracle Network. Off campus, Hollinshead has participated in the Martin Luther King Jr. Day of Service, volunteers at Concordia Village where she helps seniors with technology questions and has participated twice in the Polar Plunge that benefits Special Olympics Illinois athletes. She’s severed as a Chemistry tutor on campus and has volunteered with several departments when she’s helped to plan events. Following graduation from UIS, Hollinshead plans to attend medical school and hopes to one day become a dermatologist.